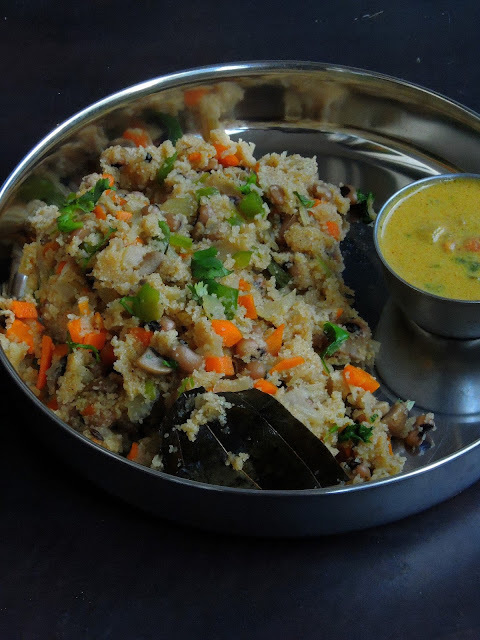 Since this upma is flavored with spices, you can pack them in anyone's lunch box, as this dish is a complete meal to carry either for your lunch or to enjoy for your dinner. 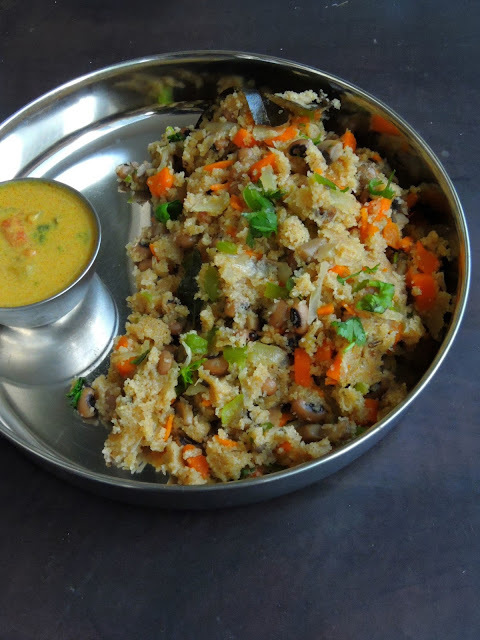 I have added black eyed peas in this upma, if you want to add any other beans,dont hesitate just go on. Am sure Red kidney beans and chickpeas works awesome as well. However adding beans is completely your own choice, and trust me adding beans to upma is definitely one of the best way to sneak beans in your diet. Am running a month of blogging marathon with an interesting theme. You might have noticed that am posting Protein loaded dishes as theme for this month's blogging marathon is Protein Rich Dishes. Heat enough oil,fry the whole spices,fennel seeds until they turns brown. Add the curryleaves,garlic cloves and fry for few seconds, add the chopped onions,ginger garlic paste and cook until the onions turns transculent. Add the mixed veggies,cooked black-eyed peas immediately,add enough salt and cook everything until the veggies gets half cooked. Add two cups of water to the cooking veggies, bring to boil. Once the water starts boiling, add the roasted rava to the boiling water, stir continously and cook until everything gets well cooked. Put off the stove. Add the chopped coriander leaves, give a stir. Wow black eyed peas in upma sounds fantastic Priya..what a filling meal this makes! Always loved upma with Coconut Chutney for breakfast.. This version with legumes looks absolutely complete..
Upma is one dish I terribly miss in these diet days. You are so tempting me to make it immediately. I could finish off the whole plate in a sitting. Excellent twist to the Upma . I have never gone beyond adding veggies , the use of chickpea, or beans sounds fantastic . That is a whole lot of veggies in this dish. A complete meal i suppose. Adding lobia in upma makes it more nutritious. Only you can think of so innovative ideas. That was one of my complaints against Upma that it didn't have a protein. You have resolved that amazingly! Will try this version of Upma soon! I never add garlic to my upma. Many times we make it without onions too. This is a new flavour that hubby will love. 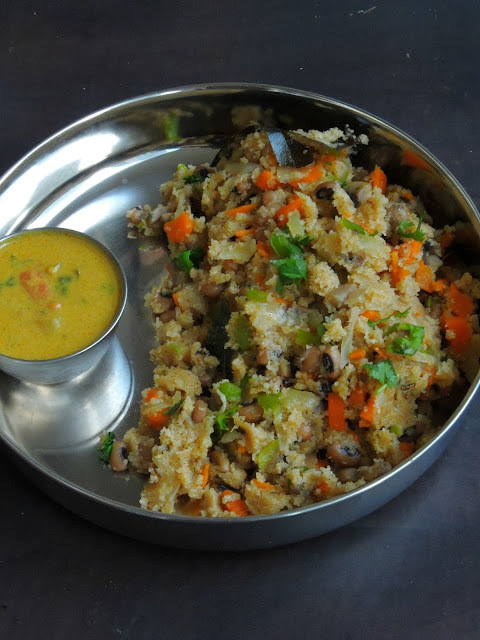 A very nutritious upma Priya. I usually add lots of veggies but from now onwards will also add beans to make a wholesome meal. Lovely healthy upma with the additin of beans... amazing twist. nice idea of adding beans to upma.. I am a big upma fan. I will definitely try this.